I am an immigrant from Vietnam. I left the land of my birth in 1978—just shy of my first birthday—and arrived in the U.S. a few weeks after I turned two. All of us on that boat, and hundreds of thousands of others, fled for the same reason: to escape the oppression of the communist regime. It took us more than one full year to arrive in the United States, most of that time spent on an over-packed freightship smuggling 2,300 other refugees on a cargo hull full of festering flour and one functioning restroom. Like many ethnic Chinese in Vietnam, my family members were merchants. My maternal grandma, who had fled to Vietnam from British-held Hong Kong as a teen to escape the Japanese invasion in the 1930s, had a fabric stall at Saigon’s Ben Thanh Market. My dad had a factory that manufactured shampoo and detergent. After the Vietnam War officially ended in April of 1975 with the fall of Southern Vietnam to the Northern Vietnamese communists, the new regime stripped our family of its livelihood, confiscating our family businesses and much of our savings. They also introduced a series of new currencies—each time capping the sum families were permitted to exchange. Anyone found with more was punished, the money confiscated. Years later, my grandma would tell of counting her life savings, exchanging the maximum allowed, and burning the remainder. She described watching her tears fall into the flames as the money burned; just burning and crying, because what else was there to do? Early in 1977, the year before we fled Vietnam, my mom was six months pregnant with me and my father was in jail for “unpatriotic acts” after commissioning the building of a small junk boat he’d hoped to use for our escape. My mom visited my dad in his cell so he could help name me. He must have had money on his mind, as my name translated means Gold and Jade. My grandfather had just passed away, but my maternal grandma still had five kids at home to raise. She was 4’9” on a tall day and a breadwinning matriarch before her time. She negotiated an escape route for us on that Panamanian freightship, but it would come at a steep cost. 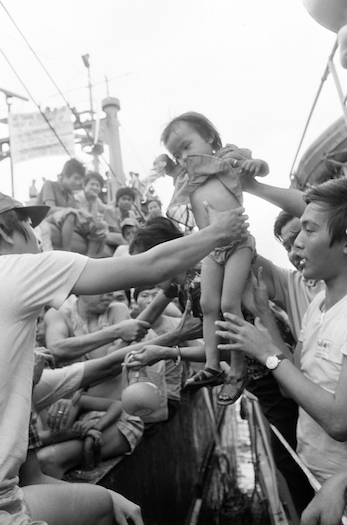 Fellow refugees transfer a Vietnamese child onto a Coast Guard boat in Manila, Philippines on Jan. 8, 1979. Eventually our freighter docked in the Philippines, but we were not allowed to disembark—all of the existing camps were full. After a full 10 months at sea we were finally transferred to a makeshift refugee camp on a Philippine island. My mom set me on the ground to roam and was pleased to discover that I could run. At the camp, my parents and extended family underwent an arduous vetting process including background checks and physical screenings with blood tests. Then came the search for a sponsoring country. A refugee who could claim a relative in another country was given priority there. Barring that, where you wound up was a crapshoot by the United Nations High Commissioner on Refugees. My parents, my brother, and I lingered in this system for several months until a church group in Minnesota agreed to sponsor us. In one fell swoop, we were whisked from the humidity of the tropics to the sub-zero temperatures of a midwestern December. The commitment and logistics of sponsoring and providing for a refugee family are significant, so the church group shared the responsibilities for clothing, sheltering, and integrating us into American life. One group of volunteers met us at the airport with donated second-hand winter jackets. Other volunteers helped us find and furnish a small two-bedroom home in the suburbs, while still others worked on getting sponsorship for the rest of our family, until all 19 of us were re-united. Our family also relied on public social programs as we adjusted and assimilated into American society. My parents enrolled my brother and me in a Head Start preschool while they studied English, passed the GED, and took job-training classes. For a year or so, we lived on welfare and food stamps, supplemented by baffling 10-pound blocks of bright orange government cheese. Within two years, my mom spoke English well enough to take a job in a bank, the start of a 30-year career that became our modest family livelihood. When it came time for my brother and me to think about college, we benefitted from the expectation of our family that we would go. We had as role models close relatives who had recently graduated. But we also relied on programs like need-based grants, low-interest loans, and work-study programs. We hear so much talk about individual resilience, self-reliance, and the proverbial bootstraps being the ingredients of the American Dream, and I’d like to think my family exhibited those traits in our extraordinary journey. But there is a lot more that goes into the American Dream’s promise of providing people an opportunity to improve their lives and to contribute to this great nation. Nothing exists in a vacuum, after all, and certainly not opportunity. We all rely on the springboard provided by our extended families, our communities (like those Minnesota church volunteers who made our American story possible) and, yes, government-backed immigration policies and programs like those that let us enter, fed us, and then helped us obtain an education. has M.Eng and B.S. Environmental Engineering degrees from MIT and UCLA. She works in the environmental sustainability field in Los Angeles, where she lives with her husband and two kids. Primary Editor: Sara Catania. Secondary Editor: Andrés Martinez. *Lead photo courtesy of Associated Press. Vietnamese "boat people" aboard the refugee ship "Tung An" hold out pails to crewmen of a Philippine Navy ship that brought a fresh supply of drinking water on Feb. 21,1979. Interior photo by Tan Ah Soon/Associated Press.